I'm thrilled to be a first-time contributor to this site. We can learn so much from each other. I serve in the primary and was asked to prepare a talk for stake conference but was not given a topic. The theme for this talk was prompted by a conversation I had with a friend, a high school senior who wasn't sure if he "knew" like everyone else did. My prayer was that it would help him realize he "knew" more than he thought he did. The response from other adults was really overwhelming, letting me know that almost all of us ask this question at some time in our lives. I hope it can be a blessing to you and your children. I enjoy staying at home with our 4 big boys and 1 little girl and sending packages to our missionary son in Russia. Recently, I was visiting with a young friend over breakfast about his future plans. As a senior, life looks a little frightening and confusing. This dear friend said to me, “I’m just not sure about a mission. You see, I’m just not sure that I know.” I have thought about it repeatedly since then. My young friend’s question is one that I have had before, perhaps you have had before… Do I really have a testimony? I’d like to tell you about 4 people who had the same question. Do I have a testimony? I don’t remember what I said to him at the breakfast table. But I have thought about it repeatedly since then. My young friend’s question is one that I have had before, perhaps you have had before… Do I really have a testimony? Elder Neil Anderson, my brother Brad, my sister-in-law Barbara and me. Do you ever expect a light, or an acorn to fall on your head in order to know? I wanted to see a light. I wanted to feel a surge of electricity from head to toe—so that I could say like others, “I know for myself.” I had heard my mother and others share such experiences. I knew they were sacred and powerful. That’s what I wanted. But I’ve since learned that not all testimonies come in that way. Hmmm. The answers which come as quiet, reassuring feelings and thoughts. Perhaps that’s what Moroni meant when he said, “He will manifest the truth of it unto you by the power of the Holy Ghost. Quiet, reassuring feelings and thoughts—Perhaps that’s what the Lord was trying to teach Oliver Cowdery and us when he said, “Behold, I will tell you in your mind and in your heart by the Holy Ghost, which shall come upon you and which shall dwell in your heart. No light, no acorn, no ATM. Just an enlightening thought or a tender feeling. Let’s go back now and look at the four people we discussed earlier. Did they ever gain the testimony they all wanted so badly? Deanna’s story: I also have learned something about my experience: I can look back in my mind’s eye and see a young girl, walking sadly out of a pink bedroom, saying nothing, wondering why she didn’t have enough faith to get an answer to prayer. But now I can also see in my mind’s eye a loving Heavenly father who was close by in that moment. I can almost hear him saying, “Deanna, I love you, and I hear you. I need you to trust what you have always known. Of course it’s true. You already know that it’s true. 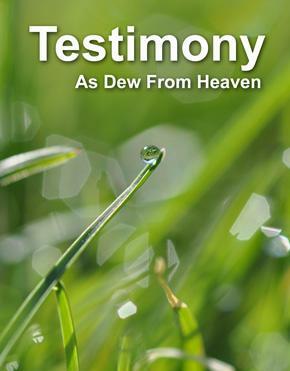 I like to think of testimonies this way: Water can come from the sky in lots of different ways right? Well testimonies are like that. Maybe you’ve seen a cloudburst? A clap of thunder and rain that comes down in sheets? There may be those who receive their testimony like that—who can pinpoint the exact moment of the thunder and lightning. But for most of us, it is more like arising in the morning and quietly finding that the dew is already on the ground. Do you remember the story of the Nephites in 3rd Nephi? There were tempests and earthquakes and days of total darkness. As the people were gathered together marveling over what had happened, they heard a voice. “It was not a harsh voice, neither was it a loud voice; nevertheless, and notwithstanding it being a small voice it did pierce them that did hear it to the center, … yea, it did pierce them to the very soul, and did cause their hearts to burn. And it came to pass that again they heard the voice and they understood it not. Brothers and sisters, we need to learn how to understand that voice. How often has he spoken to us and we understand it not. It is called the still, small voice because it is just that… still and small and quiet. So often we miss it because the world is fast and noisy and busy. To my young friends that are here today. You have felt that still small voice. You do have a testimony. You already know a lot. You know that you are a child of God. You’ve been taught that since you were a small baby. It feels right. You believe in prayer. It is often the first thing that comes to mind when you scared, or hurt, or desperately needing to talk to someone. That means you already have a testimony that God lives. That he loves you and that he hears your prayers. You believe in the Savior Jesus Christ. You love him. Something in you wants to be like Him. You don’t know everything. I don’t know everything. I suspect President Parker doesn’t quite know everything. But your testimony is strong. Karl didn’t know everything. But he had a testimony. Have you assumed that everyone else has had a stronger witness than you have? If you listen carefully, you’ll hear the ways in which the still small voice speaks to them and you’ll realize that you know, the same way they know. Have you had a good feeling while singing a song? Then you have a testimony like our beloved prophet Gordon B. Hinckley. As a 12 year old boy, he gained a testimony of the Prophet Joseph Smith as 300 men stood and sang “Praise to the Man who communed with Jehovah”. He just knew. Have you ever had a peaceful feeling while your were reading the scriptures? Then you received a witness like Oliver Cowdery did. The Lord told him to think back to the night he had cried out to know. “Did I not speak peace to your mind…What greater witness can you have than from God?” (D & C 6:22-23). Have you ever thought about the Savior—how much he loves us—how much he endured and suffered for us and felt a tear come to your eye? Then your testimony shows like that of Elder Jeffrey Holland, who shed tears in conference as he spoke of how this perfect Son walked so utterly alone. That is a testimony too. Have you ever heard someone speak in church and it made you want to be better? Then you have a testimony like the Prophet Alma who heard the words of Abinidi. He just knew they were true. The words made him want to be better, to repent, to change the direction of his life. He spent the rest of his life teaching others about the truth, all because of the words he heard Abinidi speak. The world is noisy and dark sometimes. You need your testimony now. A testimony will give you comfort. It will keep you safe. It will be a foundation for your whole life. The time has come to let your foundation harden. If you are continually digging up your foundation to see if it’s really forming, you’ll never be able to build. Trust what you know. Trust the feelings of happiness and peace and calm that you have felt in the past. And when you come to things you don’t know, don’t worry. That’s part of growing. Pray about it and put it on the shelf knowing that a loving Heavenly Father will give you knowledge line upon line. Move forward being obedient to what you know is right. Your testimony is growing. Mine is growing. Your testimony doesn’t have to sound like anyone else’s. Stand where you are. Say what you know. And now, I offer a plea to parents here today. The Lord needs us, he expects us to help our children in the process of gaining and understanding a testimony. May I offer some suggestions. Encourage your kids to attend. Whether it’s trek, a fireside, service project or primary activity. You never know when the Spirit will speak to them. You can’t buy a testimony. It is built on many tender experiences. If they miss something, they really miss something. You don’t get a testimony from reading somebody’s notes. Talk, help them connect the dots. Help them see the bigger picture, Ask questions. “Do you see how the Lord answered your prayers? Do you see how you felt peaceful? That is how the Spirit speaks. Help them identify when the Spirit is present, not only that but tell them what that means. The Holy Ghost testifies of truth. Share your experiences, daily. Make your daily dependence on the Spirit visible and tangible to your children. When you bear your testimony, say HOW you know. Share your thoughts, feelings, impressions. I know that God lives because I have felt his quiet answers to my prayers. I know that Joseph Smith was a prophet of God because when I was serving a mission, we watched “The First Vision” probably 200 times. And every time when I watched Joseph go into the grove to pray, my heart pounded and I felt like I would cry. It was so amazing! I watched the movie anxiously every time, knowing that the most wonderful thing was about to happen. I know that Jesus Christ is my Savior. I know that because I love looking at paintings of him. I can gaze at them for a long time. And every time I speak of him, a feeling of pure love comes into my heart. I know because every time I read of how he calmed the sea, or how he fed 5000 even though his heart was aching, or how he suffered in Gethsemane, I feel the biggest heart swell. I can’t contain it. I wish I could sit at his feet. I wish I could tell him thank you. I wish I could tell him I love him. And if I could sit at his feet I know in my heart what he would say to me, Deanna, I love you. You know this is true. You know it. I pray that we may all learn to hear those whispers, that we may recognize the testimony of the truth that lies within.